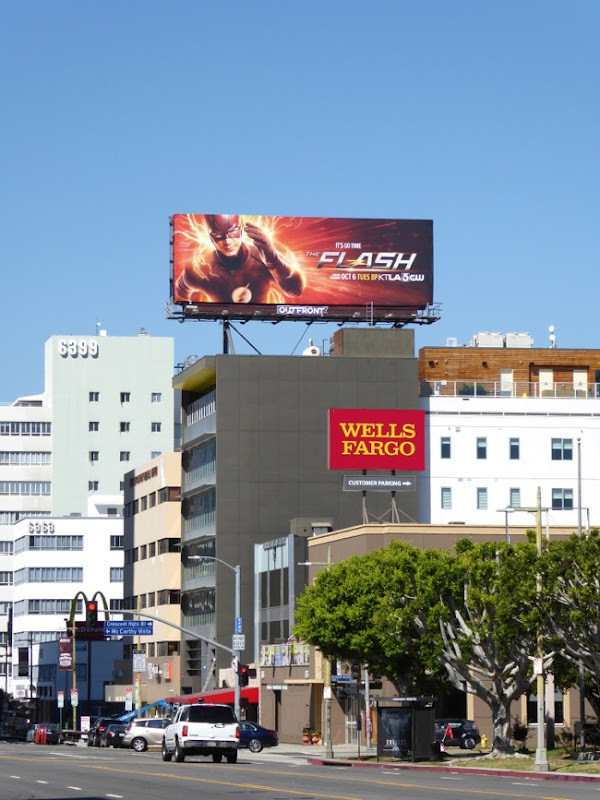 When we left Grant Gustin's 'Barry Allen' at the end of the first season, the scarlet speedster was racing against the impossible to save his friends, family and the entire planet. 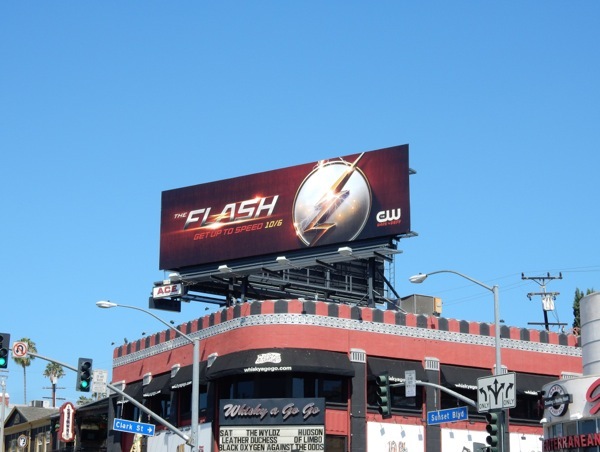 The bets are that The Flash succeeds, otherwise it would be a very short sophomore season. 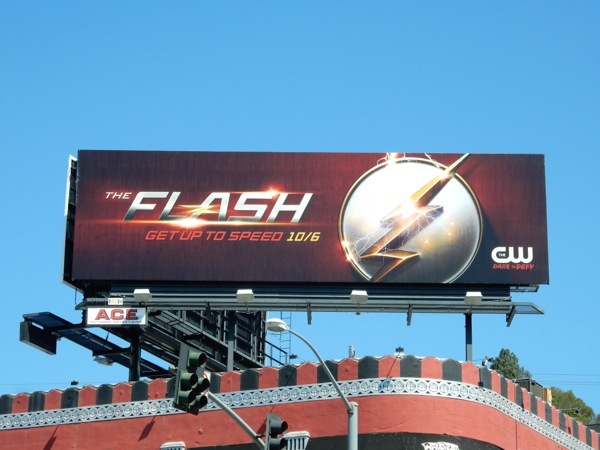 However expect some changes in the world of Central City this season, including adjustments to the hero's super-suit which sees his emblem change to the iconic yellow lighting bolt over a white circle, and a greater exploration of the DC Comics character's lore and other super speedsters to bear the mantle of The Flash. 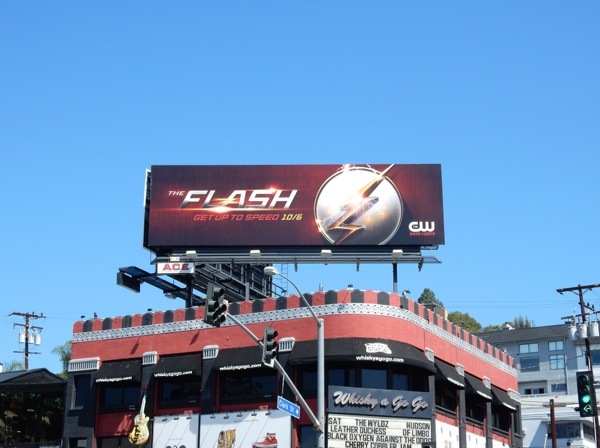 Accidentally opening a wormhole to another Earth could cause all kinds of problems for the young superhero, but Daily Billboard is sure he'll have a helping hand from his friends at S.T.A.R. Labs and even his mentor, 'Oliver Queen', may drop by to lend a hand (or arrow or two) at some stage. 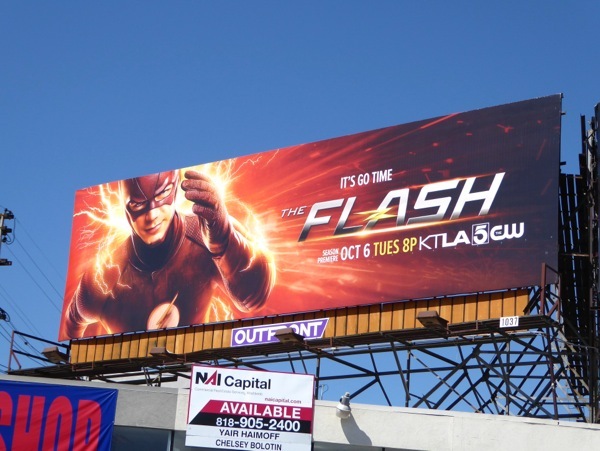 These second season billboards for The Flash certainly have a confidence to them, and people keep saying that the comic book bubble is going to burst soon, but for now there's no end in sight with Supergirl also flying high in the skies at the same time as our crimson comet for this Fall TV season. 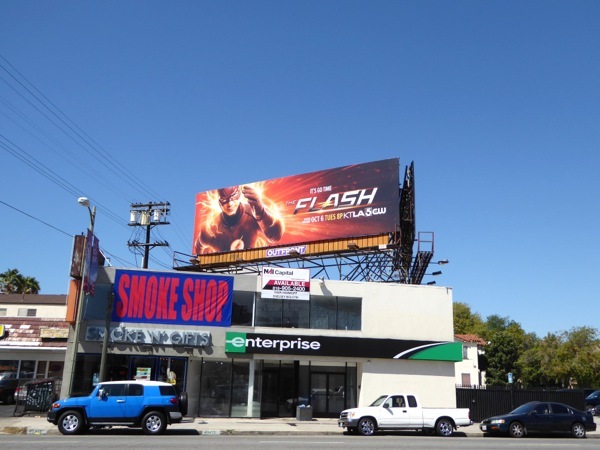 The 'Get up to speed' teaser billboard was first spied above Whisky A Go-Go along the Sunset Strip on August 1, whilst the 'It's go time' ad creative was snapped along La Cienega Boulevard and high above Wilshire Boulevard on September 19, 2015. 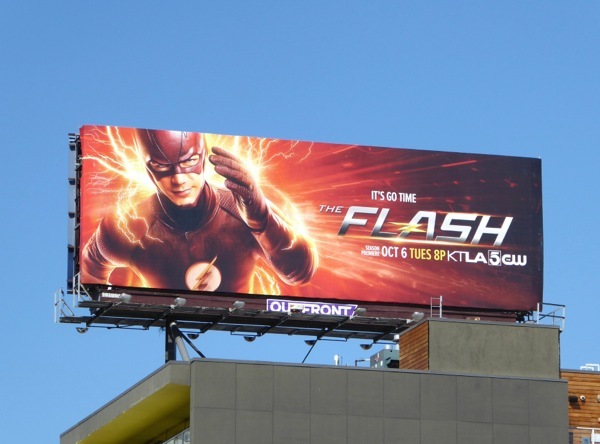 If you're a fan of the hit show on The CW, be sure to also enjoy all these season one billboards for The Flash from a year ago. Set your clocks, because 'it's go time'. Blink and you'll miss him. 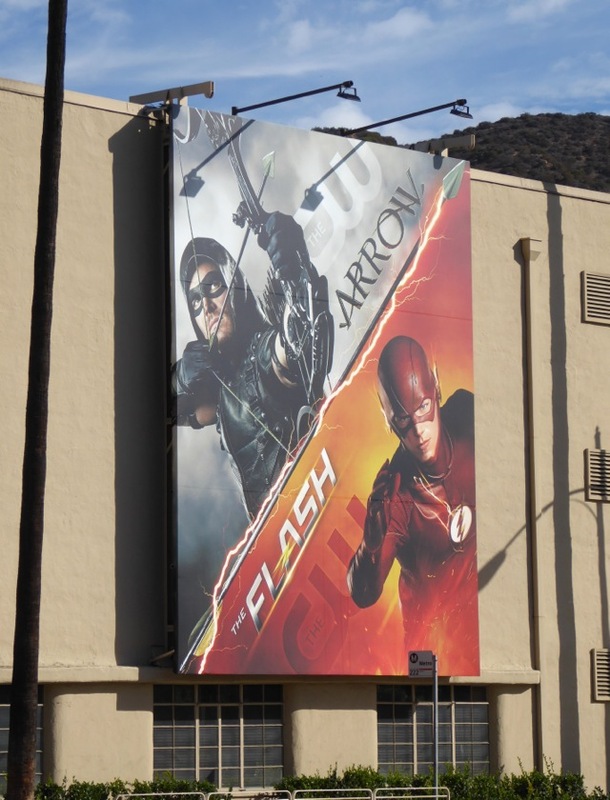 UPDATED: Here's also a joint Arrow/The Flash billboard for the two shows on The CW, spied at Warner Bros. Studios in Burbank, California on January 2, 2016 (although it's been around since their respective fourth and second seasons debuted).